Your reunion committee is joyfully at work planning an expanded weekend reunion program for a momentous 50th year commemoration. The site is the Radisson Hotel in Plymouth and the weekend activities will take place on September 25, 26 and 27, 2009. For a fun time, save that weekend! Planned activities (subject to revision and your suggestions) include a golf outing, a gala Saturday night banquet, a hospitality suite at the hotel for Saturday afternoon and evening, Sunday brunch at the hotel, and for those interested, a Sunday morning Plymouth Harbor brunch cruise. Note Regarding The Golf Outing: The golf outing is being planned for Friday, September 25th depending on the level of interest. Please respond to the committee at the main return address below if you are interested in participating in this event so that the committee can make arrangements and set up the appropriate format (scramble, best ball, or just normal foursomes). We are seeking addresses, phone numbers, married names and email addresses of our classmates. If you have acquaintances who have moved or are likely to be off our radar screen, feel free to alert us. We will try to get a mailing or email notice to them. We are welcoming friends of the class, “near classmates”, such as those who were with us for years and who moved, flunked algebra, or for some other reason didn’t graduate with us. Send along some of those names as well. We certainly welcome teachers and coaches if we can locate any. We are trying to keep costs and the price of the banquet reasonable. To that end we will be cheerfully accepting sponsorships or contributions from any who wish to help ($25 to whatever). 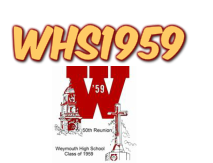 This will be a distinctly low pressure fund raising operation but in the spirit of class camaraderie, checks can be made out to “Weymouth High School – Class of 1959” and sent to the main return address below. We look forward to seeing you and your guest at the reunion! Here are the details for what promises to be a great 50th Reunion Weekend! Golf Event – Depending on how many people wish to play golf, the committee will be selecting a course in the Plymouth area which can accommodate our party and offer modest green fees. Tee times, greens fees and directions will be provided to those who select golf as an activity they will participate in. Greens fees will be paid directly to the club selected. Hospitality Suite – From 4:00 P.M. to 6:30 P.M. and after dinner until Midnight. Buffet Dinner and Dancing – From 6:30 to Midnight. Music will be provided by the well known DJ, Hank Morse. The price for dinner which includes the hospitality suite and music is $75.00 per person. During the aforementioned open times of the hospitality suite, complimentary beer, wine, soft drinks and snacks will be available. Please note that the price has been reduced by $8.00 per person thanks to the generosity of classmates who have made contributions. The committee is still accepting contributions (from $25 to whatever) to defray the cost of the hospitality suite and assist in the awarding of a scholarship to a deserving WHS senior in the name of the Class of 1959. Class Photograph – A class photograph will be taken during the evening. Those wishing class photos can purchase them directly from the photographer after the photo shoot. They will cost between $25.00 and $30.00. 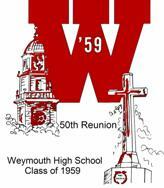 A limited number of rooms have been reserved for the reunion weekend under the designation, WHS-Class of 1959. These are available on a first come-first served basis. You should call the hotel directly for reservations. The hotel telephone number is (508) 747-4900. In order to take advantage of the group rate, you must make the reservation by telephone. Please note that hotel parking is limited to areas designated as the Radisson West Lot and the Radisson North Lot. The hotel’s address is 180 Water Street, Plymouth, MA 02360. We are still seeking addresses, phone numbers, married names and email addresses of our classmates. If you know of those who have moved or are likely to be off our radar screen, feel free to alert us. We will try to get a mailing or email notice to them. We are welcoming classmates, friends of the class, and those who were with us for years and for some reason didn’t graduate with us. We certainly welcome teachers and coaches if we can locate any. It’s important that you complete the form on the next page and return it with a check for the required total amount so that it is received no later than August 15, 2009. Attendees who have prepaid for the dinner will have their names held by committee members at the door. Unfortunately, no dinners can be purchased at the door. The hospitality suite will be available only to those who have prepaid for the dinner. When sending your payment, please note your maiden name, if applicable. Please make checks payable to Weymouth High School, Class of 1959. All forms and checks must be mailed to Dot Miller, P.O. Box 757, East Dennis, MA 02641. Additional information may be available at the class web site at www.geocities.com/whs1959main/. Check there occasionally for updates. We look forward to seeing you and your guest at this momentous reunion! Please place a check mark next to the event(s) you wish to participate in and include the appropriate information. Further information about the golf event - time, place, cost, directions, etc. will be sent to those who check the Golf event. Please note: Checks and forms must be received no later than, August 15, 2009. 9-11PM Hospitality Room-Check desk in lobby for location. Well, our 50th Class Reunion is just around the corner, so let's pray for good weather. The Brunch Cruise on Sunday is in order aboard the Pilgrim Belle paddlewheeler. All participants should arrive at the pier around 9:45a.m. Tickets are not required and boarding will begin at 10:00 a.m., rain or shine. In case of severely inclement weather, they will still have the brunch; but the boat won't leave the pier. DIRECTIONS TO THE PIER FROM THE RADDISON: Upon exiting the front door, turn right and follow the waterfront past Mamma Mia's and Isaac's toward Mayflower II and Plymouth Rock. You'll be able to see the masts from a distance. Cross the street just before Mayflower II and walk past the restrooms and the Mayflower II office out to the pier. The Pilgrim Belle building has a sign on the roof: "Cruise Plymouth and Cape Cod". It's approximately 1/2 mile to the Pier from the Radisson; but it's advisable to walk, as public parking is sometimes hard to find and they charge for it. See you on Saturday and Sunday.